The NBA should be free-flowing and exciting this season, but Nate Duncan has four players he's especially excited to watch. The NBA has the best off-season in sports by a mile. In basketball, where a single player so often swings the outcome for a franchise, the draft and subsequent ping-pong movement of players in free agency carry far more intrigue than in other sports. What Butler did a year ago at the relatively advanced NBA age of 25 was unprecedented. The statistical metamorphosis was eye-popping, with massive increases in his PER (from 13.5 to 21.3), efficiency (from 52.2 to 58.3 True Shooting Percentage), and most impressively, his usage (from 16.8% to 21.6%). Despite his increase in offensive responsibility, Butler slashed his turnover rate from 10.8% to 7.7% of the possessions he used, which ranked 10th in the league among the 110 players with usage rates above 20% (considered an average player load). More impressive was the skill development that produced such sterling results. In 2013–14, Butler was totally unable to create for a stunted Bulls offense desperate for any offense he could muster. A year later, even with Derrick Rose and Pau Gasol on board, Butler was the Bulls’ best option. He suddenly was money from three and midrange, even unveiling an effective turnaround in the post. The Bulls wing also emerged with one of the best triple-threat games in the league, using his improved jumper to set up beautiful jab-step complexes and explode to the rim. Once in the paint, Butler was one of the league’s best at drawing contact to get to the foul line. Although Butler is not yet at that age when players typically begin to regress, he evolved so far beyond what anyone could have expected last year that it seems foolhardy to forecast another leap. The Marquette product, though, is talking about expanding his game this season. The next step for Butler in Fred Hoiberg’s offense is creating for himself and others off the dribble in the pick-and-roll, and he appears off to a solid start in preseason. Hoiberg’s offense and the Bulls’ newfound reliance on the three-pointer can give Butler the spacing to unlock this part of his game. Though healthy skepticism of “Point Jimmy” is warranted, it will be awesome to see him try. Perhaps it’s because he will be toiling in Minnesota (playoff drought: 11 seasons and counting! ), or because he averaged a mere 10 points per game at Kentucky and stuck to playing in the post, but 2015's consensus No. 1 overall pick is entering the season with decidedly little buzz. Towns is likely to change that in short order. All signs point toward Towns starting at center, and he has already flashed his skill level in summer league (where he wowed as a passer) and the preseason (with some ridiculous step-back jumpers). Towns is completely comfortable shooting NBA threes, although that is unlikely to be a featured part of his game in this developmental season for Minnesota. It appears that the Wolves will first focus on continuing to develop his inside game. With Towns’s skill level and evolving toughness on the interior, he is my choice to be the best rookie this season, if maybe not the favorite to actually Rookie of the Year. The Heat have a ton of talent, but the overall fit remains questionable. On both ends, Miami will rely on Chris Bosh's versatility to keep a very fragile machine running. Offensively, spacing the floor will prove difficult with Dwyane Wade, Luol Deng, and Hassan Whiteside also in the starting lineup. At various times, the Heat will require Bosh to pick-and-pop, pick-and-roll, spot up for threes, finish dump-offs, and play high-low with Whiteside. 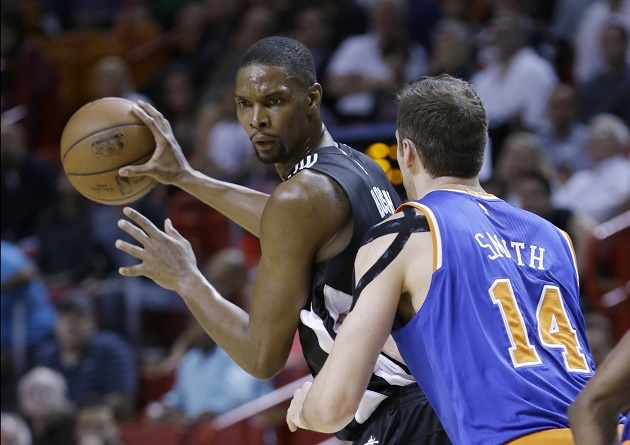 Bosh also is most likely to win his nightly matchup against the Heat’s key East rivals. The Cavs (Kevin Love), Bulls (Nikola Mirotic), Wizards (Kris Humphries or Drew Gooden), and Raptors (Patrick Patterson) all have key guys who are defensively challenged at Bosh’s power forward position. On defense, Bosh will be required to guard stretch fours, execute the Heat’s trademark pick-and-roll traps, protect the rim, and switch onto smaller players. He may guard everyone from DeMarre Carroll to Pau Gasol in the East this year, and the Heat’s defense depends on him playing at the level he did during the franchise’s recent championship years. Despite all the Heat’s additions, they will need the 31-year-old Bosh to be their best player if they are to make any noise in the East. Through the first half of the 2013–14 season, the Indiana Pacers fielded one of the best defenses ever and Hibbert was the runaway favorite for Defensive Player of the Year. Fifteen months later, Indiana dumped his salary to the Lakers so it could sign Rodney Stuckey, Chase Budinger, and Jordan Hill. Despite an eighth-ranked defense last season even in the absence of Paul George and George Hill for a combined 115 games, the Pacers clearly thought they were better off without Hibbert’s $15 million salary. No NBA aesthete loves Hibbert’s plodding game, but his season in Los Angeles will prove a fascinating litmus test on the value of the pure rim protectors. Hibbert is basically the only plus defender on the Lakers' roster; L.A. has nothing remotely approaching an average perimeter defender on the roster, along with a coach whose teams have not ranked outside the bottom five in defense this decade. If Hibbert can drag the Lakers anywhere near an average defense, it would strongly indicate that his boring game still has value in the league. While the three-pointer has risen to prominence essentially uninterrupted since the shot was introduced in 1979–80, NBA nerds are quick to point out that threes remain a more efficient shot than twos league wide. * The number of three-pointers taken should continue to rise (presumably through attempting more difficult shots, relatively speaking) until the effective field goal percentage on threes reaches equilibrium with that on twos. Based on preseason returns, it looks like the league will be taking a significant step in that direction in 2015–16. The Wizards put up an average of 25 threes per game in their first two preseason tilts, with power forwards Kris Humphries and Drew Gooden combining to launch 14 threes in 54 minutes. Under Fred Hoiberg, the Bulls dropped 11 of 19 threes in the first half (of 41 total attempts) against Minnesota on Saturday en route to 65 points. Center Pau Gasol took three of those with absolutely no hesitation. New Orleans promises to emphasize the three even more under Mike D’Antoni acolyte Alvin Gentry, and Anthony Davis has already dropped three in the preseason. The list goes on. The Hornets drafted Frank Kaminsky and traded for Nic Batum in the offseason, significantly upgrading their shooting. Indiana will play Paul George at the four instead of their traditional two-big alignments. Talk is Toronto will place DeMarre Carroll at power forward this year, and stretch four Patrick Patterson will start at center. Chatter out of Oklahoma City has emphasized the spacing in Billy Donovan’s offense. Even DeMarcus Cousins is shooting threes for Sacramento. And the league’s mass incorporation of the Steph Curry flyby (a pump fake and side-step along the arc for three instead of stepping in for a two-point J) could add half a point to league scoring average on its own. With all the talk of pace and space, the fans are the real winners. While league curmudgeons may bemoan the demise of post play, hand-checking, and hard playoff fouls, evidence indicates fans like the current style. Fast breaks, ball movement, threes, and drives to the basket have come to define the NBA, and the league is far better for it. This should be the NBA’s most aesthetically pleasing season yet. • The inauspicious injury news out of New Orleans does not bode well for the start of the Alvin Gentry regime. While the injuries to Omer Asik (out three weeks with a pulled calf) and Alexis Ajinca (four to six weeks with a hamstring injury) might unlock freewheeling lineups with Anthony Davis at center, the Pelicans are running out of NBA rotation players. Kendrick Perkins was the only center on the roster before they signed Jerome Jordan on Saturday. Quincy Pondexter is out indefinitely as he recovers from knee surgery, and Jrue Holiday will be limited to 15 minutes per game to start the season. Alvin Gentry can compensate by playing Dante Cunningham more at the four (where his long twos are more acceptable), but he’s rarely provided rotation-quality minutes. It’s looking like Norris Cole could start at the point, with major minutes for Perkins, Alonzo Gee, Chris Douglas-Roberts, or Luke Babbitt. That is going to drag the Pels down regardless of their frontline talent. • The Timberwolves’ decision to start Zach LaVine shows forward thinking. How else are they going to get a high enough lottery pick to draft his replacement? I kid, I kid. It’s too early to foreclose on LaVine becoming a solid player, but he has a long way to go on both ends after rating as one of the worst players in basketball a year ago based on advanced metrics. While Minnesota has a lot of young talent, the deficits in shooting and offensive intellect should result in a bottom-10 offense again this year. • MORE NBA: Can Anthony lead Knicks to the playoffs? • Jahlil Okafor should be a volume scorer for the Sixers this year, but he’s going to need to learn some new tricks to be an efficient offensive creator. He has fantastic touch, but cannot live on that alone. He needs to get deeper post position and develop more power moves that draw fouls. His defense has been encouraging, however, and he does have the physical tools to defend, with quick feet and a 7'5" wingspan despite average explosion. Philly also has him sprinting the floor harder than he ever did in college while playing short minutes in the preseason. It seems the idea is to teach him how to play harder in shorter stints, rather than pacing himself through longer ones. • Kristaps Porzingis has been starting for the Knicks in the preseason at the four. His shooting touch and quick release are NBA ready, but he will be defensively challenged at power forward due to his lack of quickness. He has shown the ability to track back and block a shot from behind on occasion after he’s beaten, though. Ultimately, I think Porzingis’s best position will be center, where his shooting can be a game-changer, and he can hang out near the rim defensively. • Emmanuel Mudiay has continued to show fantastic passing vision in the preseason, and his three-point touch has been better than advertised (if suspect, due to his bad career free throw shooting). He also looks pretty good defensively for a rookie point guard. Unfortunately, it looks like finishing at the rim is going to be a struggle for him this year, as he clearly does not yet have a feel for NBA shot blockers. It would not surprise me to see him shoot under 40% this year, bright though his future is.